Towels include brass lock clip and grommet. Embroidery Tape Charge: $75.00 (Up to 10,000 stitches) Embroidery area is 3"x 3". Delivery Time: 3-4 weeks screened, 4-5 weeks embroidered, 6-8 weeks woven. Add $.10 each for individual polybagging. Shipping is billed at cost. The Drizzle Stik is the ultimate in wet weather club protection. 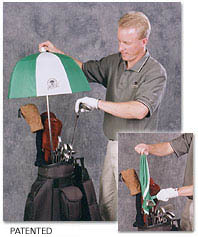 It has a deep canopy design (like a miniature umbrella) and a golf club grip with a telescoping shaft. This allows you to stick it in your golf bag and cover the top of your bag while it stays firmly in place in the wind and the rain. When not in use, it tucks neatly ion your golf bag. Due to the early success of this hot product, pricing has been reduced by the manufacturer as reflected above. One color set-up charge is included in listed price. 2-Color logo, add $45.00 set-up charge. Imprint area "5x5". Production time is 10-15 days after approval of a paper proof.